Howard Milstein serves on the Board of the Shakespeare Theatre Company, where New York Private Bank & Trust and the Abby S. and Howard P. Milstein Foundation underwrote the 2007 production of Hamlet, the 2009 production of King Lear and the 2010 production of The Liar. The Milsteins also supported the campaign for the Harman Center for the Arts, naming the Milstein Mezzanine Terrace West. In 2003, Howard Milstein provided crucial funding for The Oedipus Plays, which enabled the cycle to run for two years and subsidized tickets for hundreds of students from area schools. 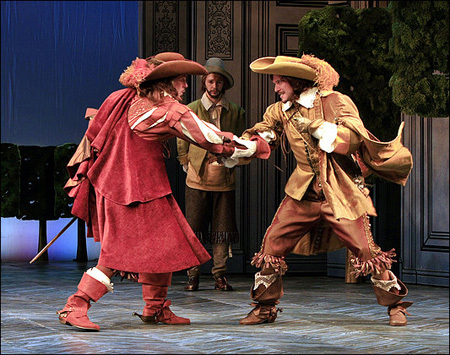 Duel scene from the 2010 Shakespeare Theatre Company's production of The Liar, underwritten by the Howard and Abby Milstein Foundation.